A Christmas wedding demands dresses that capture the beauty and wonder of the season while reflecting the bride's personal style. 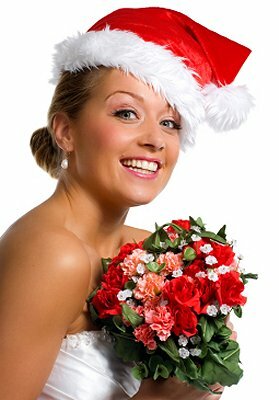 Finding the perfect Christmas wedding gown is easy with so many holiday choices! Nothing says Christmas like a festive splash of color! At once classic and contemporary, accents of traditional Christmas colors like red, cranberry, or evergreen add a special touch to a white wedding gown. Try a simple fur wrap for practical warmth and a beautiful look. An ivory wedding dress is accented beautifully with a white wrap for a holiday wedding. Long sleeved gowns have a stately aura, and are both gorgeous and practical for winter or Christmas weddings. They also help keep you warm in chilly weather without needing a separate jacket or wrap. For a bit of coverage on a Christmas wedding gown, but one that offers a delicate and pretty touch, many brides consider lace sleeves. Add some sparkle for a gown befitting a regal affair. Ribbons work for more than just presents - a pretty ribbon accent at the waist, hips, or other place on your Christmas wedding dress can add an elegant and festive touch. Try tying it in the front or to the side instead of in the back. Love the look of a simple or easy flowing gown, but want to amp up the Christmas feel? Consider a dress that has a gold underlays or accents for a unique holiday feel. If gold's not right for you, silver is another metallic perfectly suited to the Christmas season. A silver-grey with embroidered accents will look beautiful on a chilly winter evening. A patterned dress that features red roses, holiday patterns, or holiday colors, is sure to be a hit. Pair it with a fur coat and heeled boots to create an informal wintery look. Many Christmas weddings are more formal than summertime nuptials, and a fitted ball gown with a full skirt can be the perfect gown for formal and semi-formal Christmas weddings. Add gloves for even more elegance! A winter wedding dress that fits the style and Christmas theme will make your bridal attire stunning.